Oh my GOODNESS! And I do mean GOODNESS. I made my annual Irish meal for the St. Patrick's holiday. This year it fell on a Saturday so I decided to make it a Sunday Supper the following day, since that is our reward day and carbs are allowed! So I went SOOOOO cabacious!! The meal started with appetizers. Sweet LAWD! Home made pretzels, beer cheese dip, cream cheese dip, and creamy mustard dip. OUTRAGEOUS! Next we had a shamrock salad - with REAL SHAMROCKS! It also had almonds, crunchy celery, Swiss cheese, and was tossed in a home made white wine vinegar-vinaigrette. Main was pulled home made corned beef, cabbage and red potatoes, side of from-skrizzatch Irish soda bread (soft, wonderful, and AMAZING slathered with Irish butter! ), and for dessert - grasshopper pie, minus the grasshoppers! Though I outdid myself - if I do say so myself, and I DO - my kitchen looked like a tornado had blown through it the next morning. But ask me if it was worth the clean up. GO on, ASK ME! Yaaaaaaaaaaaaaasss! Preheat oven to 375 degrees. In a large bowl, mix together flour, sugar, baking soda, baking powder, salt and butter. Stir in the one cup of buttermilk and egg. Turn dough out onto a lightly floured surface and knead slightly. Form dough into a round of sorts and place on prepared baking sheet (see notes). In a small bowl, combine melted butter with 1/4 cup buttermilk; brush the top of your round loaf with a little of the buttermilk / butter mixture. Use a very sharp knife to cut an "x"; into the top of the loaf round. Bake about 45 minutes, or until golden brown, brushing the loaf with the buttermilk / butter mixture every fifteen minutes or so until it's gone. NOTES: To make my own buttermilk, I pour two tablespoons of white vinegar into a measuring cup and pour milk over it until it reaches remaining one cup. Need more? for each cup of milk you add two more tablespoons of vinegar. Let sit at least 20 minutes. It's so easy and you don't have to buy buttermilk and then wonder what to do with what's left over! When most people hear, "We're having succotash with dinner", they don't get too excited, and feel they have to suffer through that part of the meal. I DO get excited. Now that it's March, and my color-themed OCD has been set to 'green', I couldn't WAIT to make this green-themed side. 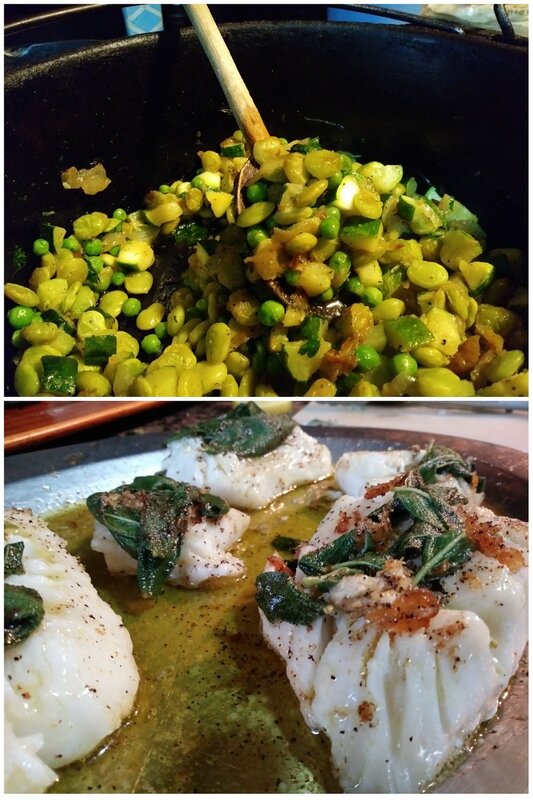 It went with our oh-so-succulent sage and brown butter cod. So we had succulent and succotash. And it. was. WONDERFUL. It was RICH. It was ER'THANG. In a heavy pot (I use my cast iron Dutch oven! ), sprinkle enough evoo to cover the bottom and let it heat for about two minutes on medium high. Carefully add the onion and garlic cloves and stir into the evoo. Let cook without stirring anymore for about two minutes, or until just-brown around the edges of the onion. Add the lima beans and stir to blend with onion and garlic clove mixture. Let cook without stirring anymore for five minutes. I know. This sounds like it's hard to do, but trust me - it makes for SUCH good succotash because it caramelizes your beans a little. Once you see the beans browning, add zucchini and stir with onion / garlic clove / bean mixture. Add seasonings and wine and stir. Let cook another two minutes. Remove from heat, add sweet peas and stir. Garnish with parsley. And stop eating it all while you're cooking it so as to save some for the others! Well, this Cleanse & Detox (word on the street is its called the SHEtox. Get it?) I wrote is WORKING! It is everywhere I look right now and I am so grateful it's helping me earn an honest living, and I'm happy it is helping people be healthier all at the same time. So I was going through some of my foodie-photos to post and came across this swordfish steak. I remember I made it in May because in my world of obsessive compulsivité (just looks fancier that way), May is pink month for me. So I made it with a pink puree made from cauliflower and a little beet juice and seared up some gorgeous fish to set on top. The beets and artichoke hearts were definitely a bonus but not the star of the show! This is SHEtox Week Two-friendly, easier than you could possibly imagine, and oh-my-GRAND-PUBA-delicious! Heat the coconut oil in a heavy pan (I use my cast-iron skillet, of course!) on medium heat. Meanwhile while the oil is heating, mix all seasonings in a bowl and rub into both sides of the fish. Lay each steak into the heated oil carefully, making sure not to crowd your pan with more than two at a time (see notes). Cook for about five minutes on each side, squeeze a little lemon over the top of each one just before removing from the pan to serve. Yes. It is THAT EASY! NOTES: If you crowd your pan with too many steaks at once, you will end up steaming your fish and will miss out on a beautiful sear on each side.